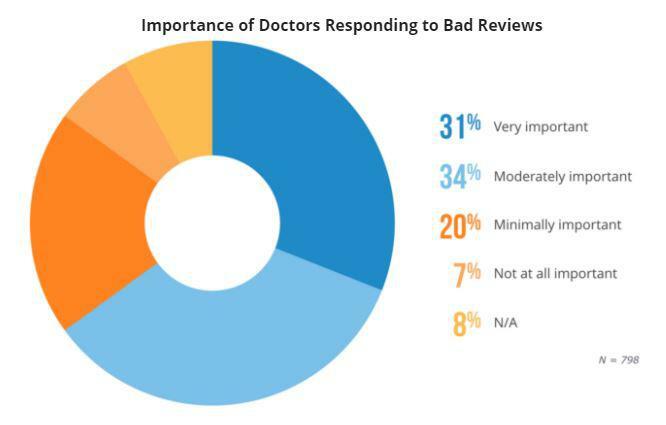 Patients are increasingly relying on online doctor reviews for verifying about your practice's reputation. According to a report by Software Advice, almost three-quarters (72 percent) of patients use provider ratings as their first step in finding a new doctor. It confirms that your online reputation is often a first impression for your new patients. This calls for a dedicated work on your online reviews to avoid a negative first impression on your patients regarding your practice. It's not just the quality of reviews (positive or negative) that matters. But there are other related aspects such as their age, volume, and whether you're responding to them or not, that affects how your (or your practice's) online reputation would personify before its audience. The importance of first impressions in healthcare can never be denied. Because reviews reflect the kind of patient experience you're able to provide, you need to be serious about what impressions the online reviews are leaving on your prospective patients. Reviews come first in the search results and stand in the forefront in providing that experience to your prospective patients. In addition to reviews, your organization's online experience is also a key component of patient satisfaction. Always know about the various aspects of online reviews that may hamper your healthcare business by presenting a negative first impression of your practice online. You have to acknowledge them so that you can focus on eliminating them. Here are the 5 online reviews mistakes that leave a negative impact on your patients' first impressions about your healthcare practice and affect their decision. Patients appreciate finding lots of reviews about you. It adds credence to your presence and popularity in the respective locality. However, even the high quantity of reviews can't save your online reputation for long if they're not flowing in frequently. A BrightLocal study cited ‘recency’ as the third most important factor of reviews. It concluded that reviews that are older than 3 months aren't considered relevant by your consumers. 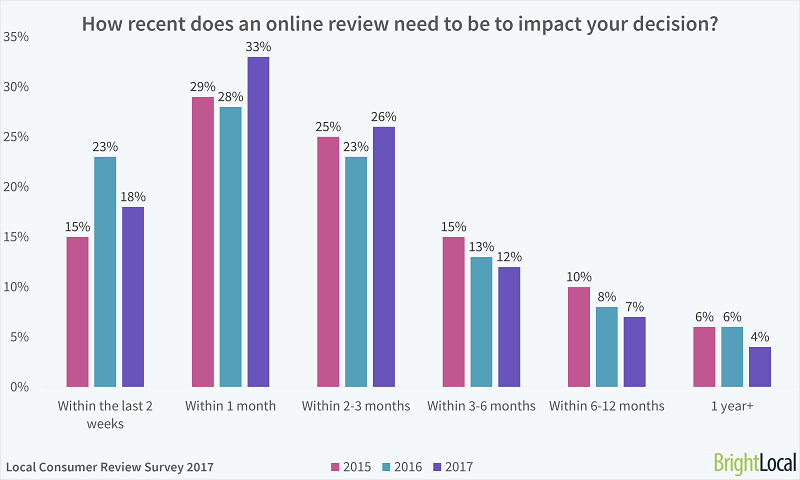 This means that your prospective patients are more likely to leave looking for you any further if you don't show up with recent reviews (within 3 months) by your patients. The statistics above also points toward the idea that consumers are relying more on recent reviews. It is becoming a clear trend with the figure rising from 69% in 2015 to 73% in 2016. After all, you cannot expect your prospective patients to judge your quality of service today based on reviews from months or years ago. Instead, it turns out to be very confusing for them to understand why reviews suddenly stopped when there were so many before. Zero reviews are as bad as negative reviews. Sometimes, even worse. On one hand, too many negative reviews will suggest a bad reputation for your practice. On the other hand, no reviews will suggest a non-existent reputation with zero credibility on the internet. Time-poor consumers (your prospective patients) who can’t find any reviews about you will instead check out other providers with at least an average review reputation. It's all the same for providers who show up with too many negative reviews. A whole bunch of negative reviews will also make your patients not want to use your service. In fact, according to the same BrightLocal study, 40% of local business consumers (including patients) would refrain from using your service if they find too many negative reviews about you. Poor reviews leave a negative first impatient on patients and damage your reputation in the eyes of search engines. Too many bad reviews lead to lower click through rates (CTRs) in search results that tells search engines to lower your search rankings. Result – less visibility on web. If there are too many negative reviews, your prospective patients won't bother to scroll any further on your profile page. They'll simply research elsewhere. If there are too many positive (5 stars) reviews, they'll be hesitant and question the credibility of perfect reviews. Most of them won't stick at finding more about you. As a simpler move, they'll leave. Patients won’t spend more time than necessary to research your practice, and will instead, look elsewhere for a more credible and reliable practice. According to a neuromarketing blog, 95% of consumers suspect censorship or fake reviews when there are no bad ones. This is the reason why you don't want to appear too good to be true. This is more so true for healthcare practices. That's because a healthcare business mostly drives on local patients. In most situations, these patients already have a general idea about your practice and its quality of care through news or views. Obviously, all those news and views can’t be perfect. So, when they find only (or mostly) 5 star ratings with too good comments about your service quality on review sites, they cannot digest it. Patients go on looking at multiple reviews websites to get a better picture about you, according to a Zocdoc. Various researches have shown proofs of that too. Landing at inconsistent information regarding your practice across these different platforms will not only confuse them, but also make them angry. Many of our existing healthcare clients were having some or other form of listing inconsistency on different review websites when they came to us. These were simple errors like not being consistent with updated information (changes in email address, phone numbers, location of business, etc.) on all platforms. However, these simple errors were causing severe damage to their online reputation. After we updated and made all information consistent throughout the review platforms, with some time, we started seeing a positive shift in conversion rates. It's necessary to ensure that your business information is consistent across all websites, including the review websites. Focus particularly on NAP (Name, Address, and Phone Number) information because that's where your patients' attention lands. Unfortunately, negative reviews do happen sometimes. While responding to them tactfully and in a highly professional manner can reduce their bad effects, not acknowledging them with a response will only add to the bad impression. Patients value responses to negative reviews. It gives them an assurance that there is someone on the other side who is listening to their concerns and taking care of it. According to Software Advice, a majority of patients (65%) believe that it's “very” or “moderately” important for doctors to post a response. Source: Software Advice There are 60 review websites focused on healthcare in the US. It's difficult and expensive to keep up with all these platforms manually. That's why it's recommended that medical practices and doctors invest in a healthcare reputation management solution for the job. We understand how daunting it can be for you as a doctor to manage online patient reviews when you are always on the move. That’s where RepuGen can help you. It automates the process of surveying patients and managing their feedback, so practice managers don’t have to. Watch how RepuGen works to improve patient experience and your hospital's performance. Because a healthcare practice is all about its reputation, it's highly recommended that you take care of these five issues with your online reviews. By improving the quality of patient care, you can grow your medical practice.